If you are looking for a way to get into the multi-billion dollar business of online gambling then look no further because our White Label Sportsbook and Casino products make it easy for any entrepreneur to run their own online sportsbook and casino business. You don’t have to learn programming, web design or be an IT specialist to run a successful online sportsbook and casino. We have done all the work for you. For the last 11 years, we have designed, tested and perfected our own proprietary sportsbook and casino software that allows for any entrepreneur with a vision to operate a profitable online gambling business. • Prompt and educated customer support through live chat, phone, e-mail. A lot of turnkey and white label casino providers claim that running an online sportsbook and casino is a complicated business to justify their high commissions, but it really isn’t. We point the fact that our clients are not left alone and clueless about what to do next. Behind each project we employ our full team of professionals. With all the technical aspects of the business taken care of, our customers can focus on branding and marketing. Even for those areas of the business we provide additional support if needed. Our focus is to establish long term partnerships with entrepreneurs interested in investing and running an online sportsbook and casino business. Because your success is our success, we are highly motivated to invest in our clients and help them grow a successful gambling business. Clients can provide their own domain name, business name, brand, logo, taglines or any other branding materials. In the event that our customers don’t have any materials available, we can provide a customizable branding package. 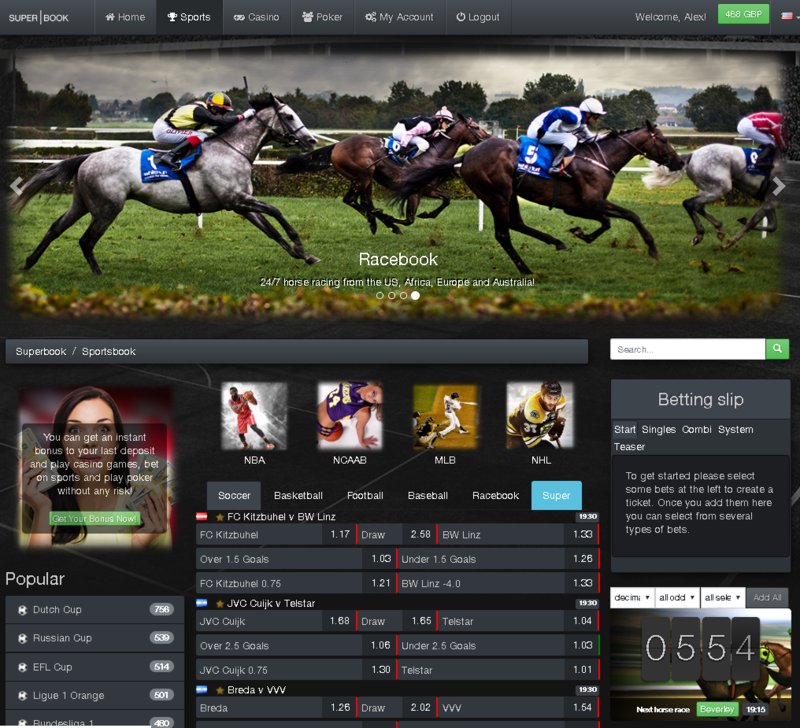 The process of setting up an online sportsbook and casino website is based on the continuous collaboration between our team of professionals (IT specialists, graphic and web designers, copywriters, marketing specialists) and our customers. We start from the ground up and customize each aspect of the business, step by step, according to our client’s specifications. This process ensures that we meet and exceed our customers’ expectations while we set new standards in the online gambling industry. The core of our proprietary White Label Sportsbook and casino platform is its highly advanced and powerful administrative panel. Think of it as a command center that allows for a very high degree of customization and provides full control over all the features integrated on the sportsbook and casino website. Some of these features include: user management module, content management system, event management (proprietary rule-based odds adjustment system), risk management (automated intelligent risk management application with real time monitoring), casino payout configuration, payment processing, marketing tools, transaction log, wagering history and many more. Now that the online sportsbook and casino is operational and configured in the smallest detail, our customers can focus on marketing strategies to attract and create a large user base. For marketing purposes we offer a variety of tools (banners, flash ads, etc.) while our team of marketing specialists can provide additional support (custom copywriting, link building, SEO, press releases, mail campaigns). Depending on our customer’s level of commitment, the initial investment can be recovered within the first year. Online casino – nothing sells better along sportsbooks than casino games. People like to play Blackjack, poker, roulette or slots online quite often and these games are very popular in all markets worldwide. We offer over 150 single player casino games in high definition graphics which will significantly increase the LTV of your users. Our casino is tightly integrated with our other products so that users will enjoy the benefit of having a single wallet across all products. Live casino games – we integrated our platform with a number of 3rd party live dealer game providers offering live games such as Blackjack, roulette, poker, lottery and many other. Users do not need to transfer funds from the sportsbook software, they can use the same wallet for live dealer games. Multiplayer poker software – our stand-alone poker software works on any device, from desktops and laptops to tablets and smartphones, without the user being required to download any additional software. We support sit and go games, cash tables and scheduled tournaments with pot prizes and guaranteed prizes. Users do not need to open a separate wallet, they can play poker from their main sportsbook wallet. Binary options trading – where users can bet on prices going up or down for commodities, metals, currencies, stocks, even bitcoins and other virtual currencies. Affiliate program software – truth be told, all sportsbooks need a strong affiliate program. We have taken the next step in affiliate marketing technology by integrating the affiliate program directly into the sportsbook software. Users no longer need to open different accounts, they can use the same account as players or as affiliate marketers. Everything is tracked, from clicks to impressions, joins and net profits and website operators also get instant insight into their affiliates stats from the sportsbook software control panel.